MicroRNAs (miRNAs) are small non-coding RNA molecules, approximately 22 nucleotides in length that regulate gene translation through silencing or degradation of target mRNAs. They are involved in multiple biological processes, including differentiation and proliferation, metabolism, hemostasis, apoptosis or inflammation, and in pathophysiology of many diseases. Numerous studies have suggested circulating miRNAs as promising diagnostic and prognostic biomarkers of many diseases. The gene for miR-126 is located on chromosome 9. miR-126-3p is endothelial-specific miRNA that regulates angiogenesis and blood vessel integrity. 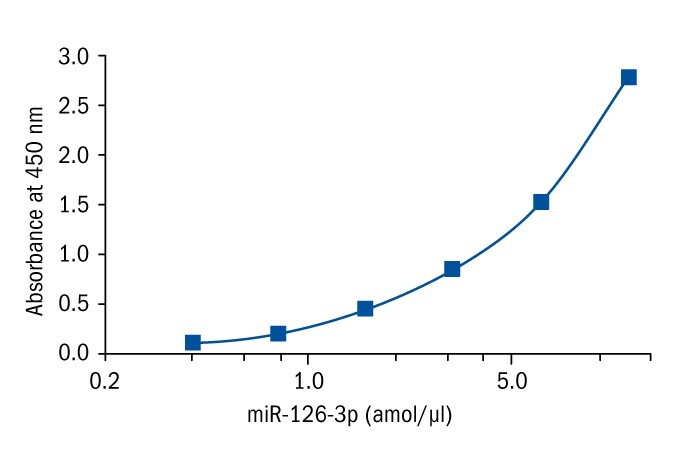 miR-126-3p also regulates expression of many cancer-related genes. Studies suggest that miR-126-3p acts as either a tumor suppressor or an oncogene in different types of cancer. Lower expression of miR-126-3p has been reported to be associated with poor prognosis in hepatocellular carcinoma. Furthermore, overexpression of miR-126-3p significantly reduced tumor size. The expression of miR-126-3p was also downregulated in malignant thyroid tumor samples when compared to benign thyroid tumor samples. On the other hand, decreased miR-126-3p expression is associated with clinically more aggressive papillary thyroid cancer. It was shown that levels of miR-126-3p in endothelial cell microparticles are abnormal in subjects with pre-diabetes and correlate with well-accepted markers of endothelial dysfunction. It was demonstrated that downregulated plasma level of miR-126-3p in patients with type 2 diabetes is associated with diabetic vascular complications. It was also found that miR-126-3p regulates lipid metabolism through targeting the genes related to lipid synthesis. Several groups have revealed that miR-126-3p levels are low in serum of stable coronary artery disease patients, and that there is a positive association between circulating miR-126-3p and myocardial infarction. Significantly lower level of miR-126-3p expression was observed in severe coronary artery disease patients compared to the healthy subjects.